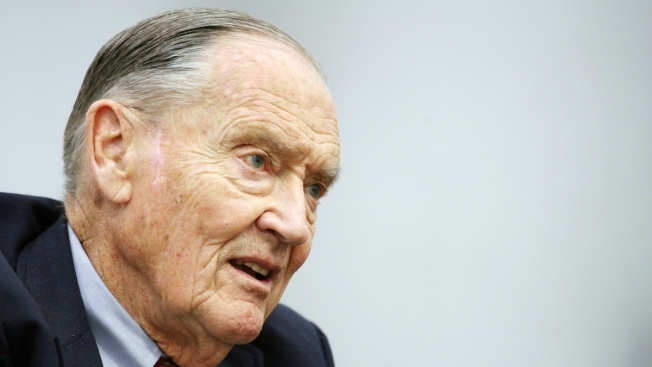 John Bogle, the founder of the Malvern, Pennsylvania, based Vanguard group, died Wednesday at 89 years old. He is credited with simplifying investing for the average person. John C. Bogle, who simplified investing for the masses by launching the first index mutual fund and founding Vanguard Group, died Wednesday, the company said. He was 89. Bogle did not invent the index fund, but he expanded access to no-frills, low-cost investing in 1976 when Vanguard introduced the first index fund for individual investors, rather than institutional clients. The emergence of funds that passively tracked market indexes, like the Standard & Poor’s 500, enabled investors to avoid the higher fees charged by professional fund managers who frequently fail to beat the market. More often than not, the higher operating expenses that fund managers pass on to their shareholders cancel out any edge they may achieve through expert stock-picking. Bogle and Vanguard shook up the industry further in 1977. The company ended its reliance on outside brokers and instead began directly marketing its funds to investors without charging upfront fees known as sales loads. Bogle served as Vanguard’s chairman and CEO from its 1974 founding until 1996. He stepped down as senior chairman in 2000, but remained a critic of the fund industry and Wall Street, writing books, delivering speeches and running the Bogle Financial Markets Research Center. Bogle also believed that the corporate structure of most fund companies poses an inherent conflict of interest, because a public fund company could put the interests of investors in its stock ahead of those owning shares of its mutual funds. Vanguard has a unique corporate structure in which its mutual funds and fund shareholders are the corporation’s “owners.” Profits are plowed back into the company’s operations, and used to reduce fees. Vanguard, based in Valley Forge, Pennsylvania, manages $5 trillion globally. It helped usher in a new era of investing, and index funds have increasingly become the default choice for investors. In 2017, investors plugged $691.6 billion into index funds while pulling $7 billion out of actively managed funds, according to Morningstar. Vanguard offers both index and managed funds, but remains best-known for its index offerings. Vanguard’s original index fund, now known as the Vanguard 500 Index, is no longer the company’s biggest, but remains among the company’s lowest-cost funds. Bogle spent the first part of his career at Wellington Management Co., a mutual fund company, then based in Philadelphia. He rose through the ranks and, in his mid-30s, was tapped to run Wellington. He engineered a merger with a boutique firm that was making huge sums, but was ousted after the stock market tanked in the early 1970s, wiping out millions in Wellington’s assets. He said he learned an important lesson in how little money managers really know about predicting the market. Bogle suffered several heart attacks and underwent a heart transplant in 1996, the year he stepped down as CEO. He reached the mandatory retirement age of 70 for Vanguard directors in 1999 and left as senior chairman the next year. Vanguard did not provide a cause of death. Philly.com is reporting he died of cancer, citing Bogle’s family. John Clifton Bogle was born in May 1929 in Montclair, New Jersey, to a well-off family; his grandfather founded a brick company and was co-founder of the American Can Co. in which his father worked. Bogle attended Manasquan High School in Manasquan, N.J, for a time, then got a scholarship to the prestigious all-boys Blair Academy in Blairstown, New Jersey. It was at Blair that Bogle discovered his knack for math. He graduated from Blair in 1947 and was voted most likely to succeed. Bogle graduated from Princeton with a degree in economics in 1951. His thesis was on the mutual fund industry, which was then still in its infancy. Bogle is survived by his wife, Eve, six children, 12 grandchildren and six great-grandchildren.